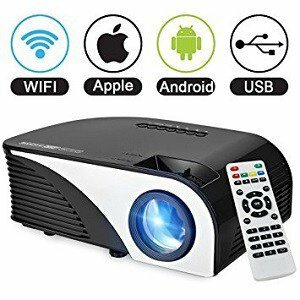 Projector and screen home theater setups are becoming more and more popular due to dropping prices and advancing technology. 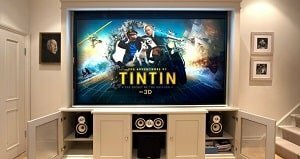 A projector installation with a home theater system can save you hundreds, even thousands of dollars in movie and entertainment costs. Imagine a family of five going to your local cinema to catch an evening movie. That’s $10 for a ticket + $5 for popcorn + $3 for a soda + time and gas spent on the trip and preparation. Family trips to the movies can be quite enjoyable but costly if you’re a movie buff and need to catch the latest releases often. Having a home theater system installed in your home gives you the option to spend valuable family time at home while saving money. Many people think of the old reel to reel machine on that roll around cart when they hear the word projector. Technology has catapulted projectors into a new world! 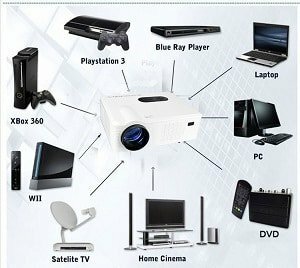 Now, projectors come in a wide variety of sizes and range from a few hundred dollars to several thousand dollars. Smart projectors, just like smart TVs, come with Wi-Fi connections and android operating systems to download apps like Netflix and YouTube so you can easily stream your favorite shows and movies. 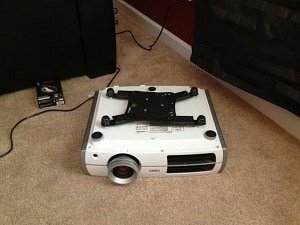 What Can I Connect To A Projector? 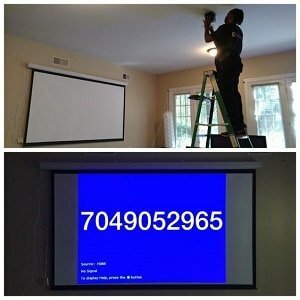 Many customers ask me, “Jay, what can I connect to a projector?” The answer is…Almost anything you can connect to a regular TV besides an over the air antenna. Most projectors come with HDMI, USB, and other AV inputs to support cable and satellite boxes, game systems, surround sound receivers and streaming devices, but most lack a digital tuner to broadcast over-the-air channels. 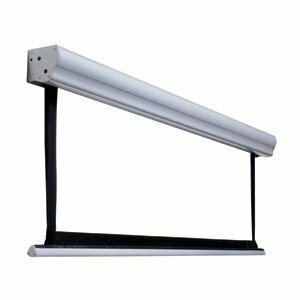 Suspended from the ceiling using a ceiling mount with or without a drop pole. Mounted on a floating shelf on the back wall. Our projector installation team can conceal the wires either way to give your home theater room the look you expect when your friends and family walk in…even with the lights on! There is nothing worse than ugly wires distracting viewers from the screen. Projector screens come in different setups. Manual pull down. You must walk up to the screen and raise or lower it with a handle. Automatic or motorized. You press a button on a remote to raise and lower the screen. Some projectors and screens have a feature called “auto trigger” that raises and lowers the screen automatically with the projector power. Fixed frame. 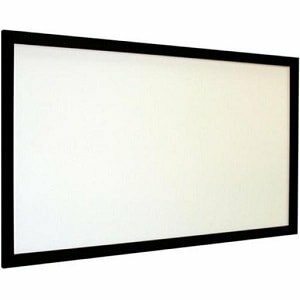 This screen has vinyl that needs to be stretched and installed inside a frame before it is mounted. The choice is yours. A projector screen will enhance the colors and create a better contrast versus displaying your projector on the wall. Price and picture size can be a huge factor in determining whether to use a screen or not. I would rather display 250″ of regular white wall than purchase a 120″ screen to make the picture a little clearer. 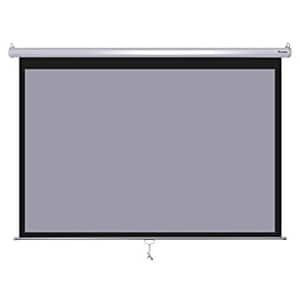 If the room size will only allow 150″ or less, a projector screen is sensible. 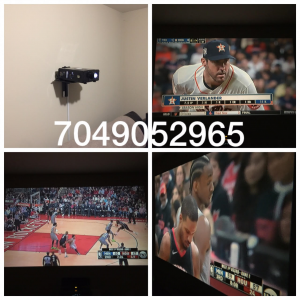 There is also the option to paint the screen area projector white or black, or projector screen wall decals by FatHead called “TV screens.” The Fat Head wall decals are sold in several stores online and have over 1600 5-star reviews to date. If you decide to use a screen, that will be the first part of the installation. Placing and mounting the screen determines where the projector needs to be mounted to properly fill the screen. 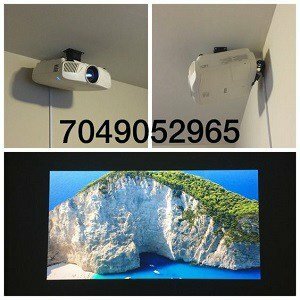 Some projectors have a wider range of options like lens shift, keystone, and zoom to give the projector Installer more freedom to move the projector which may be necessary to secure a ceiling mount or shelf to a wall stud or ceiling beam, or to avoid a ceiling fan. If you decide to have a screen installed with your projector installation, here is a projector and screen distance chart to give you an idea of picture size based on the distance from the projector to the wall. Projectors come with horrible sound so get ready to invest in some big sound to match that big picture. A reasonable surround sound system will cost you about $500-$700 for the receiver, 5 speakers, and a sub-woofer. Do not buy a home theater system from a white van at a gas station or car wash. The white van home theater system is no match for a professionally installed store bought home theater system. A 1000 watt home theater system with the right speakers will give you plenty of crisp highs and deep bass to keep you on the edge of your seat without having to turn it all the way up and disturb your neighbors. If your home theater room or man cave is not pre-wired, we have ways of concealing the cables. 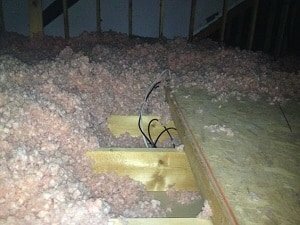 Attic wiring. Not for the faint of heart or clumsy. This requires Wall fishing skills, crawling in installation, and tight rope walking on the beams in your attic. One slip and you fall through the ceiling. You must have a pull down door and attic access above the room. Under the carpet wiring. 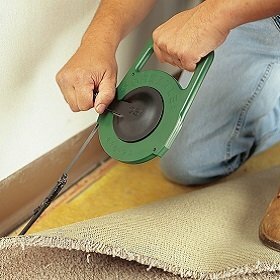 If you don’t plan to install hardwood floors later, we can run low voltage wires like speaker wire and HDMI cables around and under the edges of your carpet. Epson is the currently the largest selling projector followed by Opta-Vision and Sony. Over the years, Epson has proved to be the top choice in projectors among our customers. It is also our top choice because of easy installation features like wide focus and zoom range, lens shift to assist with off-center projector installation, and great keystone adjustments. You can see hundreds of our projector and screen installation pictures in our Pinterest page and website gallery.